The new Jeep Grand Cherokee is a Trail Rated SUV, ready to turn heads around Corpus Christi or Port Lavaca, fit for trips to the office or weekends outdoors. We like to say “it’s a Jeep thing,” and we think that when you find your new Jeep Grand Cherokee below and drive it home from Allen Samuels CDJR Aransas Pass, you’ll understand what we mean. The Jeep Grand Cherokee offers Kingsville drivers a range of performance and entertainment features that allow it to walk the line between work, family, and fun better than the competition. 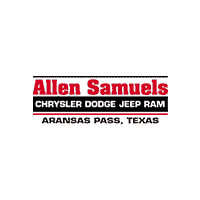 Test Drive a Grand Cherokee at Allen Samuels CDJR Aransas Pass today. Stop by Allen Samuels CDJR Aransas Pass today and see why the Jeep Grand Cherokee earned the Highest Model Loyalty in it’s class by IHS Markit (for 3 years running!). Contact us to learn more or schedule your test drive.